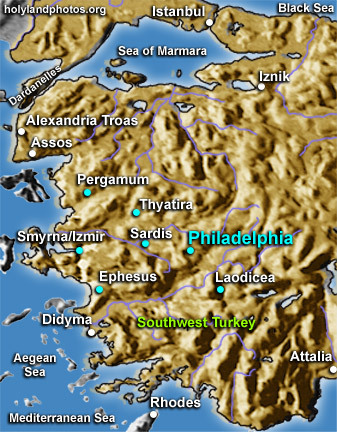 Philadelphia (modern Alashehir) is one of the seven churches that John addressed in the book of Revelation (3:7–13). It was founded in the third century B.C. by one of the Pergamenian kings and named after Attalus II (159–138 B.C.) who maintained "loyalty/love" for his brother, Eumenes II (197–159 B.C. ), in spite of Roman pressure — thus the name "Philadelphia" (brotherly love). It is located about 80 mi. [127 km.] east of Smyrna (Izmir) in western Turkey. In NT times it was at an important road junction, for a major route coming from the east, which terminated at Smyrna, ran though it. In addition it was on a diagonal route that ran from Pergamum 111 mi. [178 km.] to the northwest to Attalia, 187 mi. [300 km.] to the southeast. In the ancient sources it was known for housing a number of temples and in A.D. 17 it was destroyed by a devastating earthquake. In Revelation 3:12 the believer who "overcomes" is compared to a pillar (stability) in the temple of God, and on him/it three names will be written — compare the names inscribed on the columns of the temple of Zeus at Euromos.